FRANCE – Illfurth - La fouille d’Illfurth « Naegelberg » mené au printemps 2013 par Loïc Jammet-Reynal a permis de documenter des inhumations du Néolithique récent (vers 3800 av. J.-C.), un bâtiment d’époque romaine (troisième siècle de notre ère) aménagé sur une terrasse creusée dans la pente, associé à un puits, des fours et des foyers contemporains. Enfin, la fouille a également permis de documenter des positions allemandes d’arrière-front de la Grande Guerre (1914-1918). Deux inhumations en fosse du Néolithique récent ont été découvertes : l’une lors du diagnostic, l’autre à la fouille. La première contenait un seul individu, tandis que la seconde associe deux enfants déposés sur le fond d’une fosse circulaire. ROYAUME UNI – Southwell - Remains of what archaeologists believe is a "lost village" have been found beneath a Nottinghamshire town. 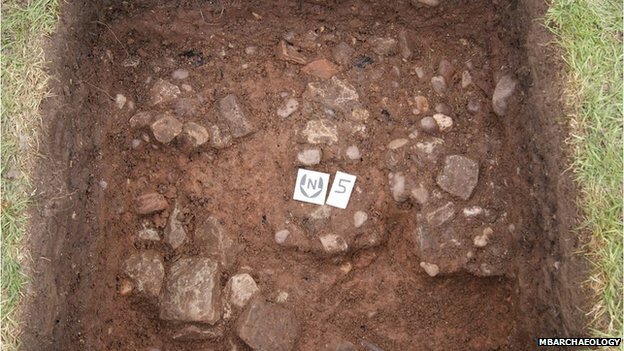 Experts say the presence of cobbled surfaces and Medieval pottery found in the Burgage area of Southwell suggests the presence a community that possibly dates from before the Norman conquest. The project was initiated by the Southwell Community Archaeology Group. John Lock, chairman, said: "We think we have found a whole village within Southwell. "It points to a suggestion that the early occupation of Southwell took place near the river. "It's very important for understanding the development of the town." The group believes the site had a village green, surrounded by cottages, smallholdings and a medieval chapel at the top. Mr Beresford added: "Seven of our nine test pits on the small part of the green had this surface, and medieval pottery dating to 1100 through to early 1200s was found within the surface itself, giving us a nice date for our site of just after the Norman conquest and through into the 1300s. 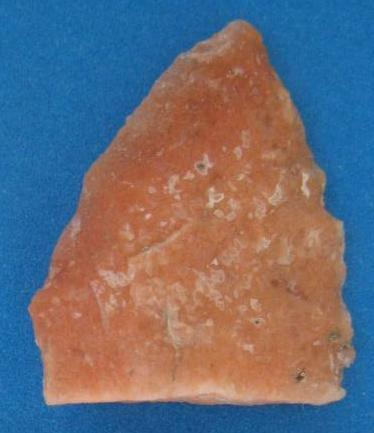 "We have also had a couple of prehistoric flint tools from the site, which it seems are the first found in Southwell. 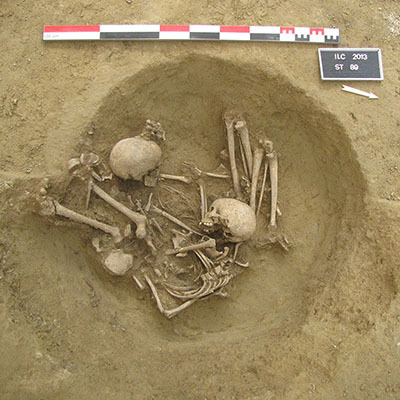 This suggests habitation in the region much earlier than we previously knew." USA – Chanhassen - Eight thousand years ago, Minnesota looked like another world. Prairie grasses covered the land, with trees sparse except in the extreme northeast. The landscape was extremely dry, with lakes reduced to waterholes and rivers withered to streams. Small groups of native people roamed the wild, hunting bison that were 50 percent larger than the species we know today. They camped in the river bottoms, close to water, fish and game. Now archaeologists are getting a priceless peek at that ancient past, known as the Archaic Period, because of a rare campsite discovered along the Minnesota River in Chanhassen during a routine survey in preparation for bridge work. “Basically, it’s like a time capsule — a very well-preserved record left pretty much intact of where it was deposited,” said archaeologist Frank Florin, principal investigator at the site, whose precise location officials are not revealing to keep away vandals and treasure hunters. “It’s exciting to know that you’re looking at things as they were 8,000 years ago, essentially.” Campsites in the river valley were occupied in a drier period of history, said Minnesota state archaeologist Scott Anfinson, probably by small groups of no more than 20 people. Over the centuries, the climate became wetter, river bluffs eroded and the campsites were covered with silt and soil and filled in as wetlands. IRLANDE – Dublin – This intriguing item, discovered by archaeologists at Diageo’s construction site at Victoria Quay in Dublin, is believed to be an ancient fish trap dating back to the mesolithic age. The wicker trap was discovered at the deepest point of the excavation near an attenuation tank and appears to be extremely well preserved. 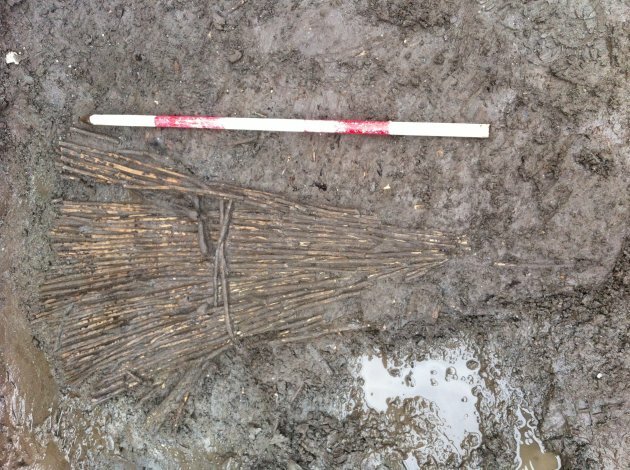 Up until now, only post-medieval material had been discovered on the site. A similar fish trap was found in 2007 at Spencer Dock on the River Liffey by archaeologist Melanie McQuaid. After dating, that item was found to be approximately 6,500 years old, dating back to the mesolithic age. Archaeologists anticipate that the item recovered from the Diageo site last week could be roughly the same age, but it can take up to six or eight weeks to complete the dating process. The fish trap is the only item of significance found in the area and it is not expected that any other objects will be found.